Age 14/15? | 1982/83? Oh wow… yet ANOTHER ‘Who’s Who‘ Page! A great way of filling publications’ pages with easy, cheap, content. 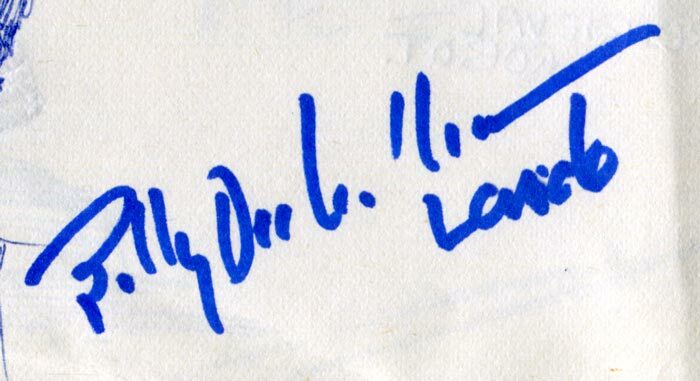 But!—this is no ordinary Who’s Who page, this is a Who’s Who page with autographs! Yep. 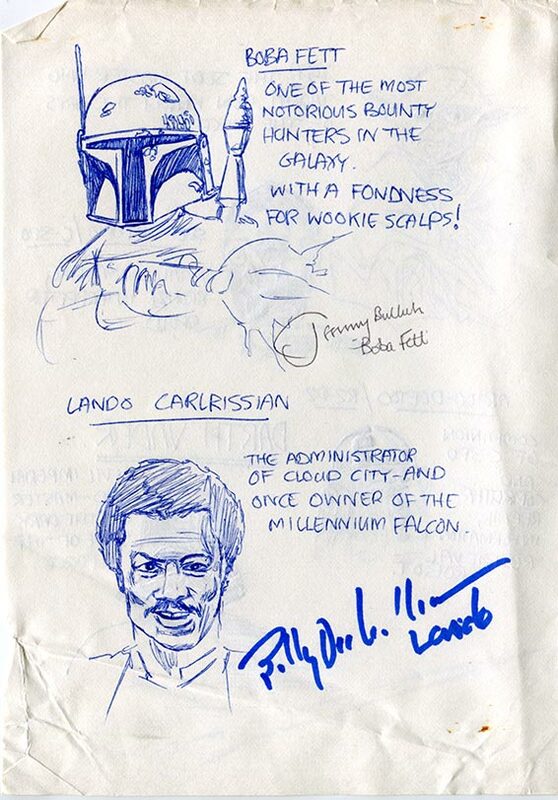 Jeremy Bulloch (absolute gentleman) signed the Boba Fett pic, and Billy Dee Williams signed the Lando one. As usual, when meeting Star Wars actors, I tried not to be fan-boyish, asking them all about their Star Wars work. 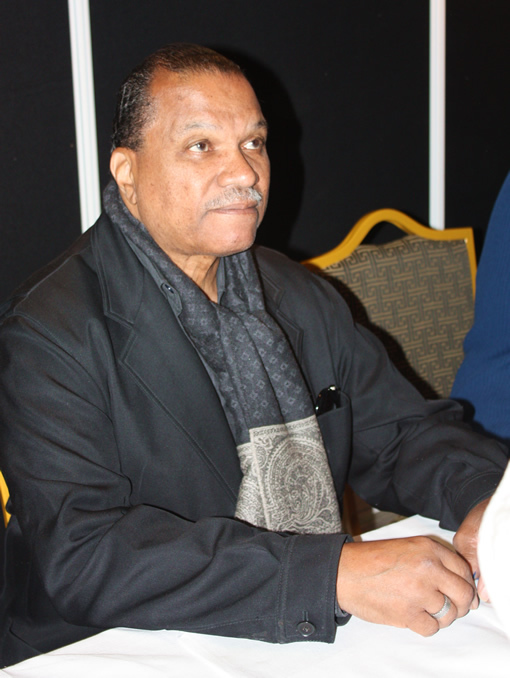 Instead I mentioned to Billy Dee, that, “When I was a kid, I watched a movie—that I probably otherwise wouldn’t have—simply because you were it.” I was curious to know if he’d remember it (silly me). “Oh, what was that?” he asked. I’d hoped he’d be pleased that I knew him for something—anything, other than Star Wars. “Christmas Lillies of the Field.” I said. “I seem to remember that you played an ex-convict, who ended up helping some nuns to build a kindergarten.” I’d never heard the word kindergarten before. “No, no. He was actually a very good man.” Oops. 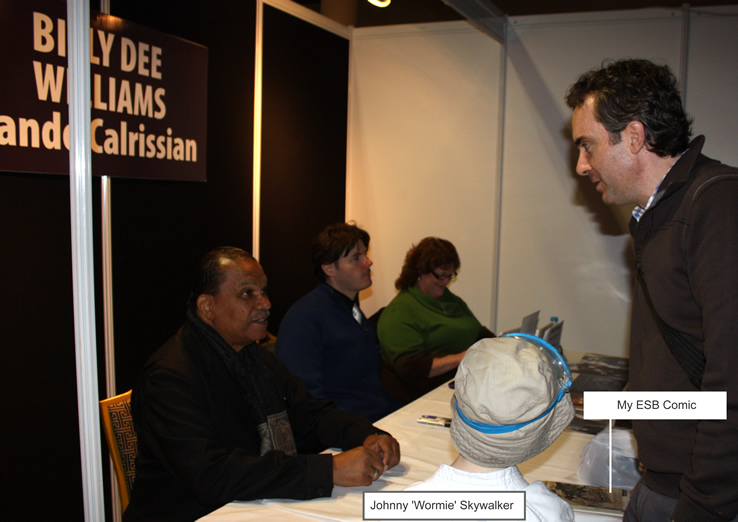 Above: Meeting Billy Dee at the Irish ‘Invasion’ show. My son Johnny is in front in his Tatooine Luke costume! So he did. And I got this nice addition to the comic. And some photos! Jeremy’s a lovely guy to meet. I’ve met him twice actually. The Irish ‘Invasion’ Star Wars shows had a good run for a couple of years in Ireland, and he was often there. At this one, I was delighted to have him autograph the comic too. I subsequently met him at another show along with <Steve Sansweet, who autographed the ‘Star Wars’ comic. Jeremy also gave me a nicely silver-ink-signed photo card freebie, which was very nice of him. 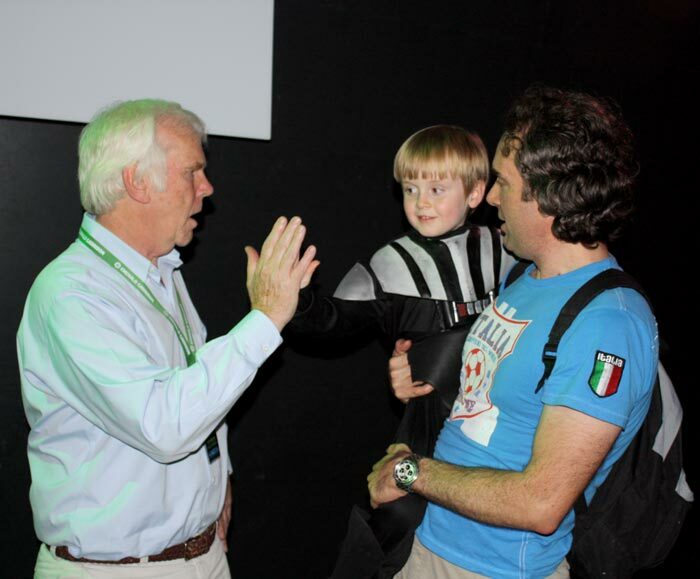 My son was a big Star Wars fan at time and it was a thrill for them to meet. He LOVED Boba and Jango Fett! You can see Jeremy below giving Johnny a high-five. Jeremy really throws himself into the whole thing. At another show, when Steve Sansweet was poring over my ‘Star Wars’ adaptation before signing it, Jeremy ‘Boba Fett’ Bulloch spotted what was going on. He leaned in and had a look too. Jeremy remembered seeing the Empire adaptation when I showed to him at the previous year’s event. He chirped <“Well, hello again!” to us, and then said to Steve, “Yes, I saw it before, it’s amazing!” (my head is swelling again) Can you imagine what the young me would have thought of that? 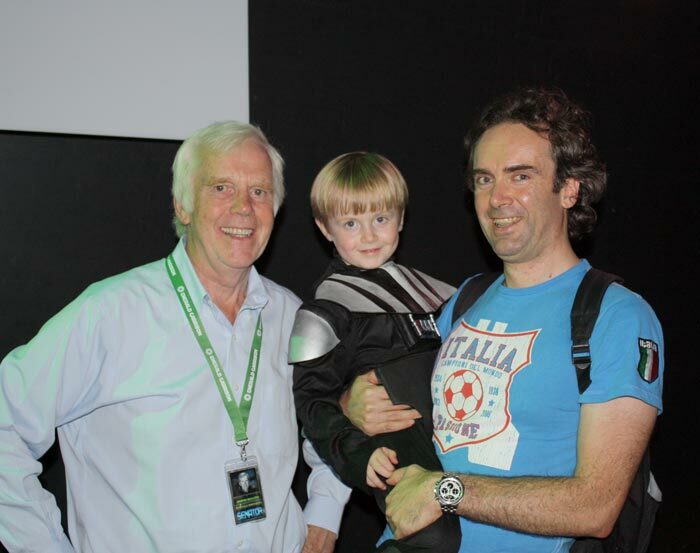 Above: Johnny and I meeting the always charming and lovely Jeremy Bulloch at the Irish ‘Invasion’ Star Wars show. It’s a pity that the INVASION shows aren’t on in the Republic of Ireland anymore. We loved bringing Johnny to them when he was a fan. Anyway, not much more to say folks, except, I hope you’ve enjoyed the incomplete Empire Strikes Back adaptation and I hope to see you here for the next projects! Keep and eye on Star Wars age 9 on Facebook and on Twitter for news and updates. 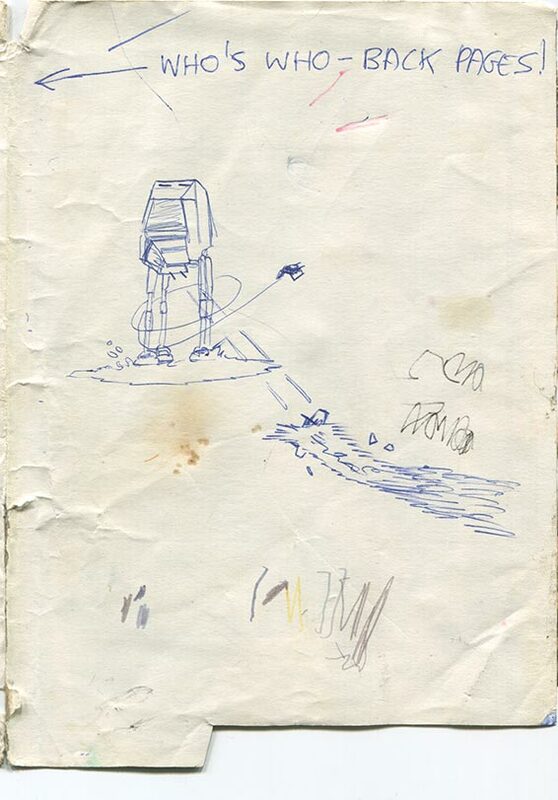 I’ll finish this Empire Strikes Back coverage with the inner-back page of the comic, which barely deserves inclusion. I always did those comics as if they were real commercial ones. I was playing make-believe basically. Girls played house, and I played publisher. As an older teen I made a few Heavy Rock magazines too, after seeing KERRRANG!